An ECGC PO has a tremendous scope for career development. The career advancement as a PO is swift. A Probationary officer(PO) is the first level appointment for a bank or insurance personnel, and is responsible for various Administrative Activities. A PO can get a promotion in 3-5 years, depending on the talent, potential and vacancies that the bank might be having. 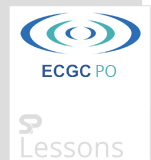 Read all the below list to get an idea about the ECGC PO Career Progression. ECGC provides an upbeat environment, full of challenges and opportunities in which employees can learn and grow. Focus is on leadership development through delegation of powers and opportunities for continuous enhancement of skills by Job rotation for overall personality development. The employees are equipped with skills and knowledge, making them assets of the Corporation through various growth-oriented programmes like training, seminars, workshops etc. From Scale-1 to 2 and Scale-2 to Scale-3, Test and Interview are required. STartingScale – 3 only interview is applicable. EXAM/SENIORITY– Minimum 3years service for scale-2 and 2 years minimum service for Scale-3, 4, 5. For scale -3 onwards, competition among own colleague. A Probationary Officer in a Public Sector organisations can appear for Associate Exams: JAIIB (Junior Associate of the Indian Institute of Bankers) and CAIIB (Certified Associate of the Indian Institute of Bankers) certification exams that will help a PO in being above others in the competitive race for Promotions.